Keep icings and fillings fresh and delicious with the Ateco 399 pastry tube covers. Simply attach this cover to the standard sized coupler on your filled decorating bags to prevent your delicious frostings from leaking or hardening at the tube crown. Perfect for bakeries and pastry shops, this set of four covers is great for refrigerating, transporting, or storing filled decorating bags. A great addition to your kitchen tools, these tubes covers will help keep your work space clean and organized. 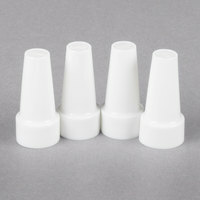 These piping tips covers are a great addition to any cake decorators tool chest! I like that they can keep the frosting inside of the piping bag contained and non dried out. FYI--They do not fit well on the large sizes of tips--just the smaller sizes. These caps are amazing!! Im ordering more today! I use these allll the time! When I am filling my icing bag, to cover my tips while I am in between colors, and to cap icing to store . I didnt think to buy more when i purchases these, but you want to order more than 4 because they are so useful. I had wash these and have never had any issues. Quality is great! This is the best price i had found on them! We use these often in our cake shop. They do not click into place so they can fall off easily if you're moving the bags around a lot. They come in handy when saving frosting for the next day though! Super easy to use and to store! GREAT price, non of the items cam damage which is a huge plus. I use this for all my decorating needs. Will recommend and purchase again! Very pleased, used for intended use. Sturdy and durable, easy to clean. Nice fit on tips. Also used as cover for icing dispenser, absolutely perfect! Great piping tip covers. The price is unbeatable and it's nice to have lots of these on hand. They are dishwasher safe and wash up nicely. These covers are a must have, especially when working with multiple piping bags or on extended baking projects. Keeps icing fresh and ready for next use without fear of contamination or mess. These work great for keeping your icing tips from getting crusty when not in use. They don't really work if you take off the coupler, but with the coupler on, they fit perfectly! The Ateco piping tip ocvers in the 4 pack and life savors! No more wrapping tips in plastic wrap! Finally found something i can use instead! So first I bought the decorating set But the cream was getting dry or yellowish. Then I decided to add tip covers to my list too. I didn't know I needed these until I purchased them!!!! allows me to safe my frosting in my piping bag for later. saves a lot of messes. I love these covers. First of all, price is very cheap, but the material is not. I love how now I can put my icing bags with frosting inside the fridge with these covers. I don't have to worry about the icing on the tip hardening before I can use it. I only recently stumbled across these piping tip covers when looking for a cleaner method while piping with multiple bags. I don't store icing once I am done, so I cannot account for how well they close and store in the fridge, but for short-term coverage while piping to reduce dried spots or messes, these are great! The covers work great after I am done decorating a buttercream cake with a plastic pastry bag. I put the tube cover on and store in the freezer. When I’m ready to fill Macarons I remove the cover and am able to use the buttercream. I purchased these to help keep my frosting from drying out and getting all over my work surface between uses. They don't stay on very well. They are really only for "covering" as there isn't any way to secure them or snap them to my coupler base, so they come off easily if the pastry bags get moved. These pastry tube covers will help ensure the icing inside your pastry tubes will remain fresh as well ask keep them from hardening. These pastry tube covers are made by Ateco and will connect easily to a standard pastry bag coupler. These are great tube covers, I like to make frosting to decorate a cake, and then once its decorated stick the extra in the fridge and these are perfect for capping the bags to prevent it from drying out so when I take the cake to the party I have some bags of extra frosting to fix any last minute messes. Great basic tip covers to keep your frosting or filling from drying out. The plastic is much sturdier than I expected. They do stain with heavy dye product but I do not care if they are pretty as long as they work. These tube covers are a great idea, and work great for small pastry tips. I wish they were available in a larger size so I could use them with my large pastry tips, but if you are using small tips these do a great job of keeping your frosting fresh while in your piping bags. The whole system with the couplers make things so much easier. A previous place I worked just stuffed a tip into the bag and that was that, but it created such a mess. The whipped cream or icing we would use sometimes leaked out the sides and we kept leftovers in a glass and it would ooze out all over everything. Having a coupler solves that with the added bonus of being able to switch out tips without emptying or needing a separate bag for a different tip. Best of all are these handy covers.......no more mess! Keeps things neat and tidy and keeps things fresher longer. Also, when you need to bring some along on a cake delivery for those possible little touch ups there are no worries of having a huge mess. Now I wish I would of found these sooner! The Ateco 399 Pastry Tube Covers (August Thomsen) - 4/Pack are very useful, I needed caps for all my frosting tips, I need to buy more, especially at this price! I love these to cover my handmade icing in the tubes. Keeps it fresh and it will not ooze out. These are great when making sugar cookie icing as well since it does tend to leak when you are storing for the next time. Wonderful covers to use when you don't quite finish your buttercream frosting! Helps to keep the product fresh without spending a whole bunch of money! Nice cover! a little smaller than I though it would be! but still a great product! easy to use and perfect for covering tips in between use. Great price! These pastry tube covers do a good job of covering up the pastry tubes so they don't dry out. They make it easy when you have several colors you are working with. These patry tube covers are solidly made, and pretty much just one of those little accessories which make life easier for a baker. Not strictly necessary or world changing but will prevent those annoying moments when something requires your attention mid piping session and you come back to some dried out icing in the bag tip. For a buck are you gonna argue. Better to have and not need then to need and not have. Really nice product, well made and great price. Great for left over icing. Heavy duty. A must have for bakers and pastry chefs ! ! These are perfect pastry tip covers. The snap on really well and don't fall off. They work perfectly for the small tips. Would definitely recomend. I purchased several of these. I thought they would be great for keeping the icing fresh while it's still in the bag, but I cannot get tgem to stay in the tips. Perhaps some threads inside them would help. These are great for when I fill piping bags early or need to transport them. No worrying about my icing taking on odors, or leaking. The fit is pretty good but could have been a little better. These are simple to use and easy to wash and clean. They are great for what they are. I absolutely love this product! These pastry tube covers are genius! They are easy to use and perfect for those pastry tubes and bags that are frequently used! Great quality! I purchased the Ateco 399 Pastry Tube Covers for home use. The quality is good and the price is even better! Very happy with purchase. This Ateco pastry tube covers work with the ateco standard plastic coupler. It is a cap that fits over the coupler to keep you icing from drying out. Has a nice tight fit. These pastry tube covers are great for covering my royal icing pastry bags and prevent the icing from drying while they are not been used. I really love these. The Ateco 399 Pastry Tube Covers (August Thomsen) - 4/Pack is a great addition to my kitchen. It has helped keep my work area cleaner. These two covers are very helpful when you're working with the a coupler on your pastry bag. It makes it a lot easier to have multiple pastry bags. These serve their purpose well. They are surprisingly hard to find and available here at a very good price. I am happy with this purchase. I am so happy I decided to purchase these. I put it off because I thought it was a waste of money. I was wrong! These have been great to have. They help leftover frosting from drying out quickly. They are also super easy to clean. Worth the money!! Tube cover, supposed to be standard size and fit all but not sure how these are fitting, they are not fitting onto the tip we already have. Great quality and amazing price. Thankful to have found some like this for this price. Perfect for standard cake tips. I use these daily for all my piping bags. These pastry tube covers are great for covering buttercream filled pastry bags in between uses. It covers the frosting tips so that the buttercream doesn't crust when it is not being used. These definitely cover pastry tips, do minimize leaks and reduce the damage from accidentally compressing the pastry bag in storage. However, there are a few issues. The covers are a very specific size that makes them just small enough to be difficult to put on without using the (icing-filled!) top of the bag for leverage and just large enough that they sometimes fall on the floor if you pick up the filled end of the bag. They're also big enough that if you leave air in the bottom of the bag and squeeze the top, that 'puff' will knock the cover off. If you're storing these flat, and just buying them for dryness protection, it's worth it. Otherwise, plastic wrap and rubber bands are better. Warm weather can attract a unwanted fly no matter how clean you keep your kitchen. Use these nice pastry tube covers and protect your product. Love these for decorating cakes! They save us a bunch of time by making it possible to cover our frosting tubes. Easy to wash and store and very economical. These are great for not allowing the frosting to dry out and for keeping the tip from leaking if your bag of icing needs a bit of time in the 'fridge. These worked very well with regular size tips and are very helpful when you are doing a highly decorated design and cannot finish it all at one time and have to come back to it, your buttercream will not be dried out. Great to have on hand! I have no idea how I had actually never used pastry tube covers prior to accidentally running into them on this site. They are one of my new favorite kitchen necessities! Will definitely be ordering more! Perfect solution for keeping my royal icing tipped bags nice and clear and without drying. A definite time savor for more detailed cookies. Will have to buy more next time! These Ateco 399 Pastry Tube Covers (August Thomsen) - 4 / Pack was okay the fit was a little off. They don't stay on the coupler. This pastry tube helped me keeping my working station clean. I used to cover the tip with either wet tissue or plastic wrapper. Sometime I have to twist the pastry bag to prevent the batter to flow to the tip before I'm ready to pipe, such as when I make macaron. I don't have to do any of these anymore now, thank to the tube cover. This tube cover fit perfectly on Ateco standard piping coupler/tip. I should have purchased these when I first purchased my ateco pastry tools. They are so handy and help with all of the mess that the pastry tubes can make. I believe I need more for larger/ more decorative cakes. Good to have to seal up a work in progress or chill a product before applying it. Simple, plastic molding that does the job without a big price tag. These pastry tube covers are great to have around to keep icing from hardening in tips while decorating cakes. I like having a few of these on hand to keep the icing ready to roll. Ateco 399 Pastry Tube Covers - 4 Pack (August Thomsen) are such handy little lids. You can store your icing in the bags and these keep it fresh. We have a lot of piping bags with various colors. This makes it easy to save them in the fridge to use later. Prior to this I would put all my filled piping bags in a container but the frosting would obviously leak. These are so helpful! I just love the tube covers. That's working great when I need to refrigerator the creams before I use it. High quality and low price. Pastry tube covers really help when either transporting filled bags or when taking a break from a detailed piece. They fit nicely on the standard coupler and prevent leakage. This is awesome.. great find. . I use this to cover my pastry bags that have to be refridgerated. Like my can Nolin cream.. keeps it fresh and no crust at tips. Frosting cakes is something I do as a volunteer project for local nursing homes, and the VA, I always have bags of frosting in my refrigerator and love these pastry tube covers, they help keep my frosting from drying out. These tube covers work great, they fit right over the tubes. They are very good when using royal icing, keeping the tips from drying out. The tube covers worked great, saves time in taking caps on and off. Well worth the money for the time it saves while customers are waiting. This is another quality product from Ateco. I use them to cap pastry bags that are filled with buttercream and royal icing between uses. They do a great job of keeping them from drying out and fit snugly on the Ateco couplers that I also purchased from Webstaurant. Worth noting - though they fit perfectly on Ateco couplers, they do not fit well on other brands, such as Wilton. Also - while they do keep icings from drying out, if you use a standard tip, such as a #2 for piping, there is some space between the tip and the top of the cover. This is typically not a problem, unless your bag is filled with a flood consistency royal icing and placed tip side down, where it may leak out. In this case, I just place my bags in an upright position to prevent them from happening. These covers are a handy way to prevent icing from drying out. I don't get a tight seal when i have a full set up of coupler and decorating tip. The cover just floats, but still prevents some air from getting in. I think these work better when there is only a coupler on the pastry bag. It is an inexpensive purchase and a good little item to have when needed. We had a hard time with these covers staying on the tubes. They help keep icing from leaking out onto the counters and storage bins, but they did not stay tight on the tips well, so they didn't keep icing any fresher than without them. Thank you for your review, Cortney. We are sorry you did not like these. In order for these to fit tightly, they must be attached to a standard coupler. I get all my Ateco products from Webstaurant Store. Great quality products and the best prices around. These pastry covers work great for their intended use. Helps to keep my icing from drying out. So evidently I was behind the game on these - they're awesome and I had no idea they existed. These go perfectly with the Ateco couplers from webstaurant and the caps work great. I primarily use this is if I'm making royal icing. It's a good cover to prevent dryness at the tip of my pastry bad. It didn't receive five stars because it can't fit really large tips and the tips it does fit, it doesn't have a secure fit. It's good, but could be better. These plastic tube covers fit most standard couplers but can still make a mess if you don't put plastic over the open coupler first. These are dishwasher safe and are ok with the high temp as long as you put them in the silverware try. With some couplers they snap in perfectly for a nice secure fit, and others not so well. Fix with extra plastic wrap and you'll be fine. These Ateco Pasty Tube Covers are the BEST for keeping your Royal Icing from drying out! They really do help create an air tight seal. These pastry tube covet work very well! No more hard crusty icing in the tip of my pastry bags! Very well priced and such a great product it should be a must have basic price for everyone. Absolutely Fantastic!! I use royal icing, mostly flood consistency. Because of this, a bag stand won't work. I use the tube covers with the couplers while I decorate to keep my tips from drying and clogging. I purchased quite a few for when I am doing many colors. These are so nice, I am amazed at all the products that are available since I started decorating cakes. I am teaching my daughter the art and it is so nice to be able to have tools that are so innovative available in this process. I would definitely suggest adding them to your cake decorating kit. We do lots of frosting/icing work especially during the Thanksgiving/Christmas season. We prefer Ateco for its dependable quality. The price here is unbeatable. Another Webstaurant winner for sure. Ateco pastry tube covers are a great value! I can take a break or decorate the next day without changing the pastry bag. I store them in the same box I keep my decorating tips. The Ateco Pastry Tube Covers are a good buy. They come four to a pack, and are of good quality. They will help me keep everything neat and organized, and I'm pleased with them. Can't even remember how many times I've thrown away half filled pastry bags of icing because they have dried out. This simple cap works very well to keep the tip fresh and ready to pipe. Love this inexpensive solution! These have made my life much easier when making cookies with four children aged 14 and under. Using royal icing can be a trying time with mess and drying issues. No longer with these on the pastry tubes. Will recommend to friends. The Ateco 399 Pastery Tube Covers - per pack. The are great for putting over your colors and keeping them fresh. The are easy to clean. Well worth the price. Nice Ateco pastry tube covers. Comes in a pack of four, very easy to use and a great price. A must have for home bakers. This kit is great for making it easy to stop and keep icing fresh in a pastry bag in between tasks! Easy to use and prevents leaks!! !